He was born in Ukraine in 1722, one of the many children of a priest. He attended the Ecclesiastical Academy in Kiev, but was disappointed by the worldliness, love of ease and western theological climate that he found there. After four years he left the school and embarked on a search for a spiritual father and a monastery where he could live in poverty. He eventually found wise spiritual guides in Romania, where many of the Russian monks had fled after Peter the Great's reforms. From there he traveled to the Holy Mountain. Spiritual life was at a low ebb there also, and Plato (the name he had been given as a novice) became a hermit, devoting his days to prayer and reading the Holy Scriptures and the writings of the Fathers. After four years, a visiting Elder from Romania tonsured him a monk under the name Paisius, and advised him to live with other monks to avoid the spiritual dangers of taking up the solitary life too soon. A few brethren from Romania arrived, seeking to make him their spiritual father, but as he felt unworthy to take on this task, all of them lived in poverty and mutual obedience. Others joined them from Romania and the Slavic countries, and in time they took up the cenobitic life, with Paisius as their reluctant abbot. In 1763 the entire community (grown to sixty-five in number) left the Holy Mountain and returned to Romania. They were given a monastery where they adopted the Athonite rule of life. Abbot Paisius introduced the Jesus Prayer and other aspects of hesychasm to the monastic life there: before this time, they had been used mostly by hermits. The services of the Church were conducted fully, with the choirs chanting alternately in Slavonic and Romanian. The monks confessed to their Elder every evening so as not to let the sun go down on their anger, and a brother who held a grudge against another was forbidden to enter the church, or even to say the Lord's Prayer, until he had settled it. The monastic brotherhood eventually grew to more than a thousand, divided into two monasteries. Visitors and pilgrims came from Russia, Greece and other lands to experience its holy example. 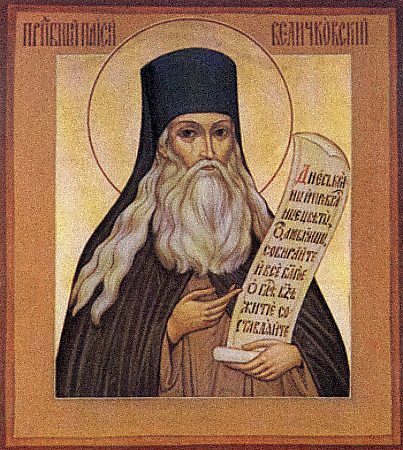 St Paisius had learned Greek while on Mt Athos, and undertook to produce accurate Slavonic translations of the writings of many of the Fathers of the Church. The Greek Philokalia had been published not long before, and St Paisius produced a Slavonic version that was read throughout the Slavic Orthodox world. (This is the Philokalia that the pilgrim carries with him in The Way of a Pilgrim). The Saint reposed in peace in 1794, one year after the publication of his Slavonic Philokalia. The Synaxarion summarizes his influence: "These translations, and the influence of the Saint through the activity of his disciples in Russia, led to a widespread spiritual renewal, and to the restoration of traditional monastic life there which lasted until the Revolution of 1917."